I have always created lists. Before my bullet journal, list-writing was the best way to declutter my brain. If I was feeling stressed or unsure of how to proceed with a situation, I would sit down and write a list. Then, a few years ago, I picked up a new technique that was right up my ally – the List of 100. This brainstorming technique has been a game changer for me, and it’s so ridiculously simple that literally anyone can do it. So what makes it so special? I first discovered this technique after I bought Journal to the Self: Twenty-Two Paths to Personal Growth by Kathleen Adams. The technique described in the book is elegantly simple. All you need to do is pose a question or theme that you would like to explore, then write out 100 ideas in a list. That’s it. Seriously. The magic happens when you force yourself to push past the ideas that you are already familiar with and come up with surprising and unexpected answers. For example, say you want to brainstorm how to be more creative. 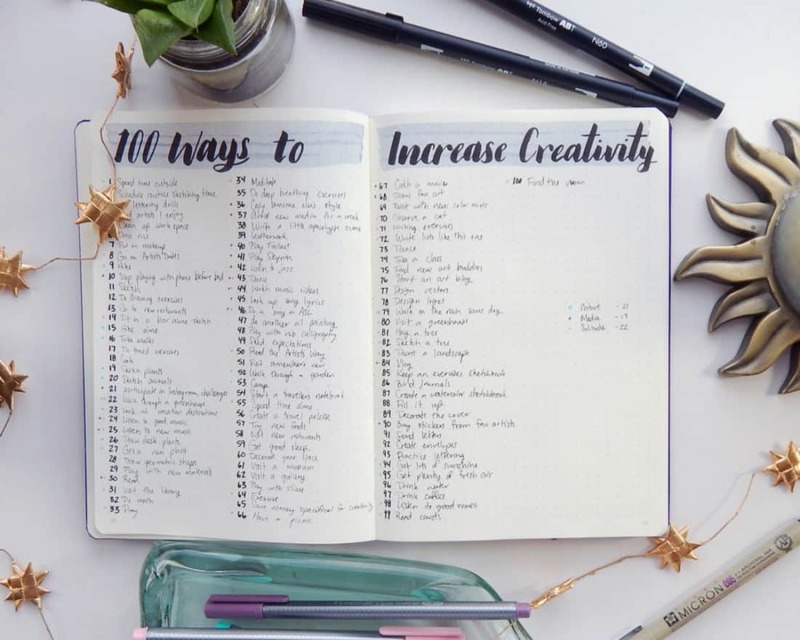 Write “100 Ways to Increase Creativity” at the top of your page, then write out 1-100. The next step is to simply fill it out! You can absolutely do your List of 100 on any scrap page, but I did mine in my Leuchtturm 1917. Thankfully, it comfortably fit on a single spread. Since this is such a simple technique, I like to keep my header nice and simple. I brush lettered the header with my set of grayscale Tombow Dual Brush Pens. Then I used a thin black pen (a 005 Micron, to be exact) to fill out the entries. Nice and minimal hit the spot for my List of 100. The point of this brainstorming exercise is to pull ideas from your subconscious mind, so that means that you need to shelf your rational brain for a second. Just jot down ideas as quickly as possible, no matter how off the wall or ridiculous they may seem. And repeats are not only allowed, they’re welcome! When your brain keeps repeating an idea, you can begin to see patterns and gain insights that might otherwise remain hidden. The first 30 or so entries will be obvious and conventional. Once you begin to run out of those obvious ideas, your brain will start to supply some interesting new ones. This is where you will begin to see some silly ideas mixed in with good ones. After you have loosened up and you have ditched your rational brain, you will see a flow of fantastic ideas stream forth. The last 20 entries will provide you with some excellent gems that you might never have considered before. There is one important rule that you must adhere to if you want the List of 100 to work for you. You must do all 100 entries in one sitting. 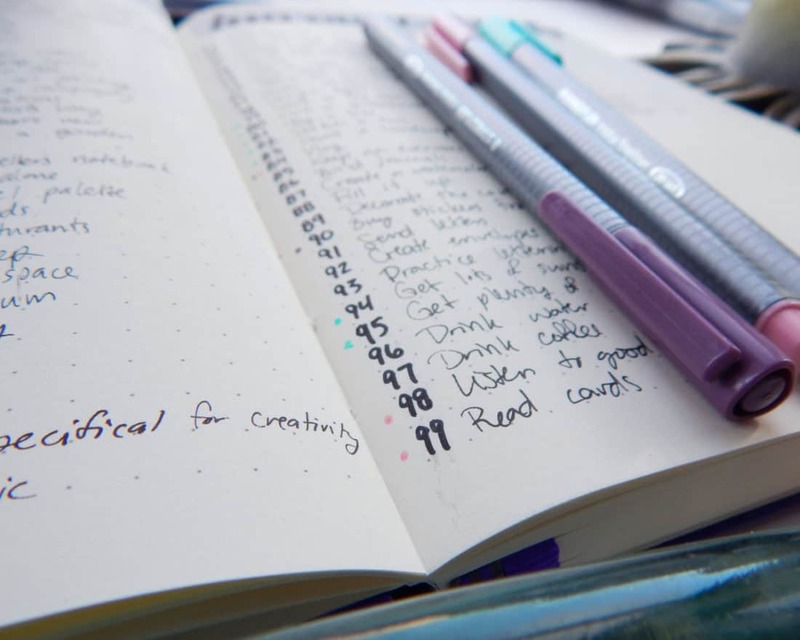 If you break your list writing into multiple sessions, then you aren’t giving yourself an opportunity to dig into your subconscious and are thus defeating the point of the exercise. So take 20 minutes and squirrel yourself away to brainstorm with this super easy technique. 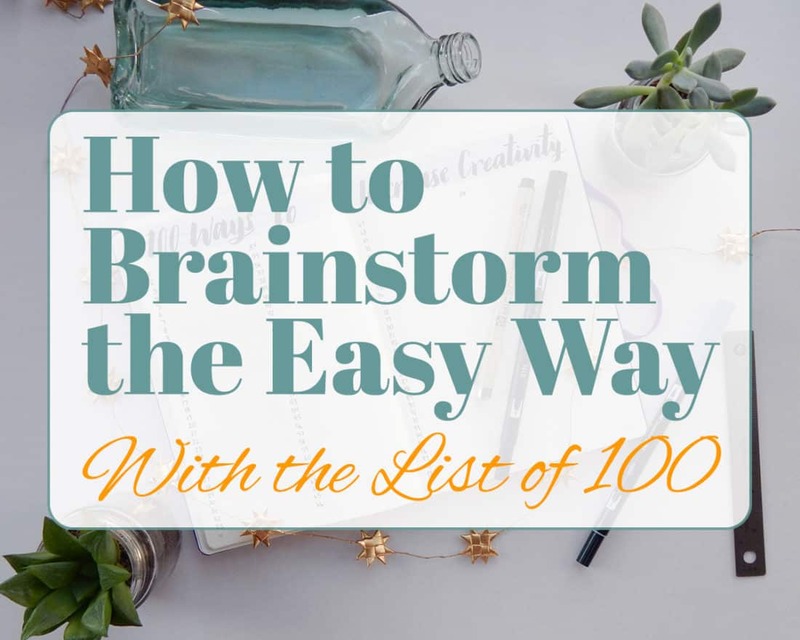 You Finished Your List of 100 – Now What? Congrats, you’ve written all 100 entries! Do you feel like you’ve gained insight? Are new ideas swirling around your head? You can totally be done right here and now. You’ve completed the exercise and done great. Some people toss out their lists, but I like to do mine in my bullet journal so I can reference it later. It’s totally up to you. I like to do one extra step after I’m done with my List of 100 to help me gather my thoughts. Throughout the 100 entries, you will surly notice a theme or two. I know I always do. 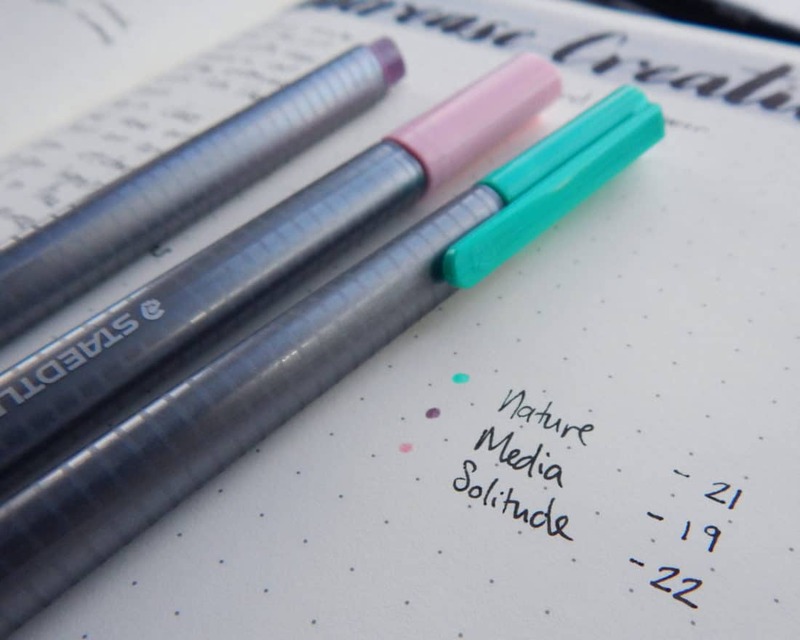 After I’m done, I go back and use my Staedtlers Triplus Fineliners to color code the ideas in my list (this always works great with highlighters). For example, in my list of 100 Ways to Increase Creativity, I noticed a nature theme while I was writing. I went back with a teal Staedtler and put a dot next to each entry that referenced nature. I did the same with different colors for entries related to solitude or media (as in music, TV, movies, the internet, etc…). After I was done, I counted up how many I had of each category. Since the list is 100 entries, each category can automatically be calculated into a percentage. Convenient, right? It turns out 21% of my ideas revolved around getting more in touch with nature, 19% included my relationship with media, and 22% had to do with spending time alone. These insights are valuable moving forward, because they help tell me what my subconscious mind wants. I often feel bad taking time to be alone because I don’t want to just abandon Jon for hours on end. However, it is something I might have to deal with if I want to get in touch with my creativity. The same goes for nature. Sometimes going outside and observing the sky and the trees is inconvenient. But my subconscious mind is pretty darn focused on going out and smelling the roses, and that’s something I want to make time for if I want to increase my creativity. Hopefully at this point, your imagination is soaring with all the things you could be brainstorming right now. 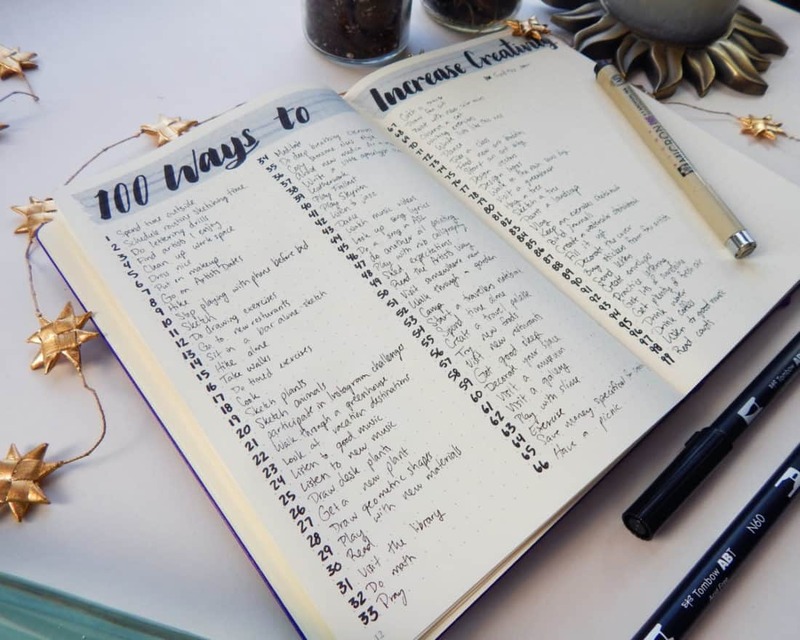 Just to help you get started, here’s some ideas for your List of 100. Anything that is currently on your mind or stressing you out is a great candidate for a List of 100, so feel free to go nuts! You will be amazed how this one simple brainstorming technique can open you up to new ideas and give you insights. We spin ourselves in circles and get wrapped up in obvious solutions that don’t really work. Now you know how to brainstorm and untangle your thoughts with nothing more than half an hour of uninterrupted list writing. Isn’t it amazing what a pen and a little bit of focus can achieve? So glad I got to your email today…finally! My daughter (my ONLY daughter!) is engaged to be married to an amazing man. As you can imagine, we have called to talk about wedding plans AT LEAST twice a day, every day 🙂 I am going to carve out some time after work today to do a List of 100 Decisions to Make for the Wedding. The part of this that strikes me the most is the writing in one sitting in order to go as deeply as possible. I’m really looking forward to this exercise. So sorry you not in a good place right now- sending good wishes your way – keep going – You will get there I have no doubt. Baby steps! I love this idea! It seems so simple but what a brilliant way to force creativity. It reminds me of what I am doing with my journaling for similar reasons. I make myself write three pages. The first page or so is no hum but then I get to what I really need to write. I will use this list of 100 as well. Thanks for the idea! Great to hear this resonated with you! This is so great! I love your colour coding on completion. How interesting! I so need this in my life right now. Thanks! I’m glad you enjoyed it! This list was a game changer for me. I feel like I have a much better grasp on everything after I do one. Hiii!! I just started with my own bullet journal and your blog is giving me so much motivation to write. I love all the ideas you’ve been sharing and its getting me excited for the year to go by faster. Hahaha and for this ‘list of 100’, you could make one that’s 100 lists of 100. Its so you could brainstorm on what to brainstorm! Hehe again, i love your blog and i really love how you are using watercolor. I wish my handwriting in cursive was as neat as yours! ❤️❤️???? I’m so happy to hear that this is helping you with your first bullet journal, Bea! And that’s a great idea 😉 And with a little bit of patience and practice, you’ll have the best handwriting of your life! Wauw I just made a 100 things/areas to declutter in our house and it took me all of 7 minutes. This is fantastic, we have such issues with getting stuff organised and now I have 100 things to tick off. What a feeling of accomplishment we’ll have when it’s done and in the process. Thank you so much for your post, this was the last step in our ‘we really want to, but aren’t sure how to start’ process. I can also see the 100 list working in other areas of my life. Isn’t this technique incredible? I’m so glad you enjoyed it, Willemijn! This list is such a great way to declutter your mind and get a firm direction. I hope you have fun checking off those 100 items! Shelby, Thank you so much for your well blended mix of thoughtful and creative posts! This post really reminded me of all of the thoughts I’ve got swirling around my brain that I need to put down on paper. It’s so nice to know that I can come back to the list and use it as a reference for projects or things that I want to track. Loved how you categorized your list and I think that’s really useful! Always a pleasure to find one of your posts I haven’t read and enjoyed yet! Shelby, I love this idea! Reading this post has made me decide to buy your book. You clearly have lots of ideas and insight into how to be more creative, and you are a fantastic writer. Mary, thank you so much! You’ve just made my day 😀 I truly hope you enjoy the book and find lots of useful information and tips! Feel free to shoot me an email when you’re finished to tell me your thoughts!